Pochette Cuir Et Poulain The Kooples. 20 cms de large sur 16 cms de haut, très bon état . N'hésitez pas, il est superbe! intèrieur en toile. Calfskin leather; lining: cotton. Made in Italy". Slightly and gently used. Like New Condition. "The Emily bag by The Kooples was designed by Emily Ratajkowski in a mini format that you'll have by your side from morning to evening. Designed in calfskin leather, it combines savoir-faire with rock 'n' roll spirit. Calfskin leather; lining: cotton. Made in Italy". Slightly used, like-new condition, buttery leather. 100% AUTHENTIC THE KOOPLES BAG. The Kooples shoulder/crossbody bag. Made of Pony hair & leather. Leopard print. 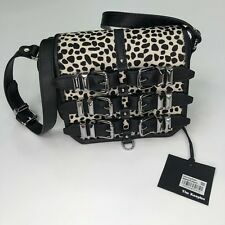 The Kooples Leopard Print Satchel. Protective cap for the snap is still attached. 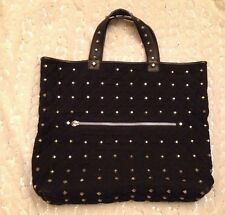 Bag is sturdy and holds its shape well. Bag Depth: 4.5". Fun, Unique, and Chic. Style : Shoulder Bag. The Kooples cheater pony hair and leather bag with buckles Across the body Great condition, slight stain on inside on cotton (foundation so could get out if you wanted) The pony hair has slightly rubbed off where it sits on hip but not noticed when worn, other than that perfect condition Rrp £325 Length 7.5" Height 6"
SIMILAR STYLE TO THE KOOPLES IRINA BAG AT A FRACTION OF THE COST. TULA BY RADLEY. MOC CROC EFFECT LEATHER. LOVELY LEATHER HANDBAG. SLIGHT MARK WHERE STRAP THAT FASTENS INSIDE HAS CURVED. ADJUSTABLE LENGTH HANDLES.